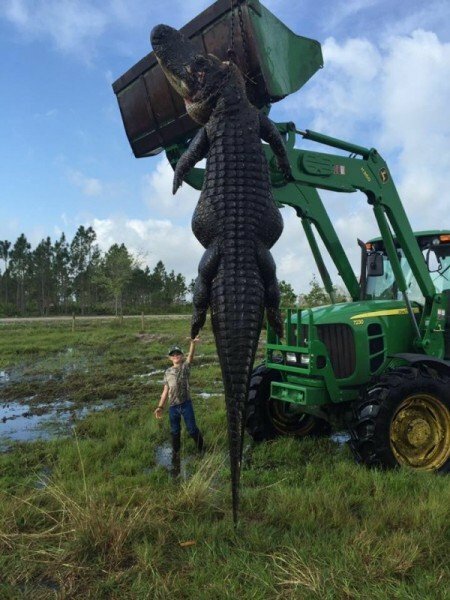 Now we’ve seen plenty of big gators here at LiveOutdoors, even a few thousand-pounders that caught our eye, but the gator pulled out of a ranch pond in Florida looked like something from another planet. The behemoth gator shot by two Florida hunters measured 15 feet length and weighed more than 800 pounds. The hunters reportedly found the gator in one of their cattle ponds where it’s believed the beast was feeding on cows. “It is hard to believe that something this big exists in the wild,” guide Blake Godwin told the local CBS television station in Miami. Godwin and Lee Lightsey, the owner of Outwest Farms, managed to pull the gator form the pond using a tractor, but it’s giant body was nearly just as big. A photo posted to the farm’s Facebook page shared widely on social media was removed after garnering negative comments. The pair told reporters they also discovered remains of animals in the pond, proving the gator was likely responsible. They plan to donate much of the gator meat and have the animal stuffed to display at hunting shows.